Registration forms are used when a patient enters a new clinic, treatment center, or hospital. It records the patient’s basic information as well as medical history. Once a patient is registered, they are entered into the health care provider’s patient portal – the secure online database that tracks the patient’s personal health information and records, such as doctor visits, discharge summaries, medication prescriptions, etc. Are you drafting new registration forms for your hospital? Are you preparing to register to a new clinic and want to familiarize yourself with the basic information often requested by such forms? Click to download any of these free Sample Registration Forms to get you started. Some medical establishments provide new patient registrations online. 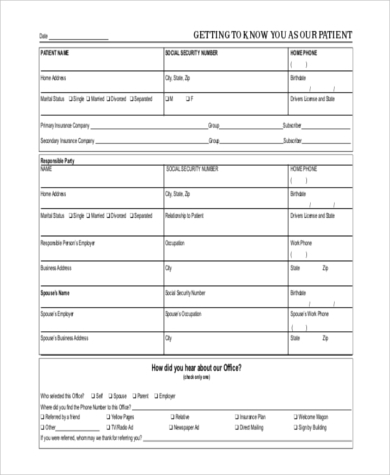 These usually come in the form of downloadable forms very much like the ones provided on this page. They are downloaded, filled out, and sent back digitally. Sometimes they can be printed out and filled in by hand, and then taken in to the clinic for walk-in registration. Other hospital and clinic websites allow new patients to register through an online form where the appropriate information is typed directly into text fields and submitted. Always make sure to consult with the reception of your chosen hospital, or refer to the hospital’s website to learn about their specific application and registration process. 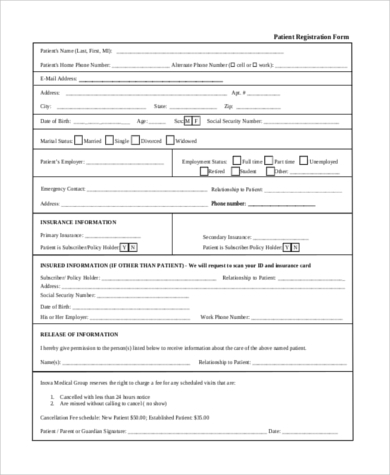 dental patient registration form. All kinds of medical practitioners maintain patient registrations. 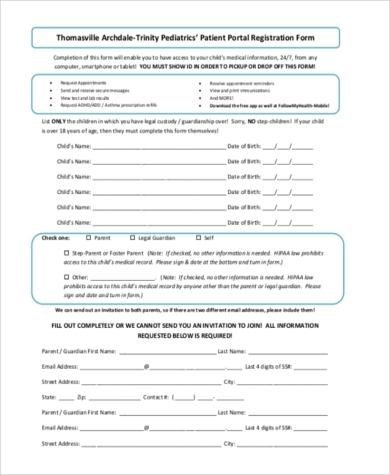 patient portal registration form. This is to register to the clinic’s secure website; once you have an account in this database, you can gain access to personal health information from anywhere with an Internet connection – note that not all new registration forms automatically include you in the hospital’s patient portal, if they have one. 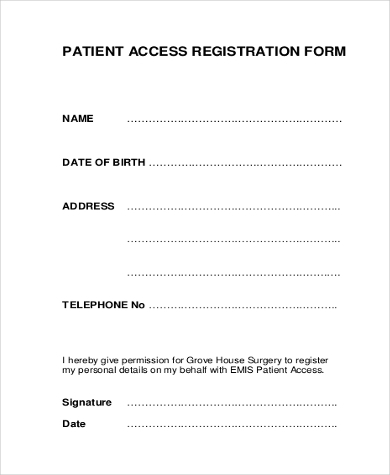 patient access registration form. 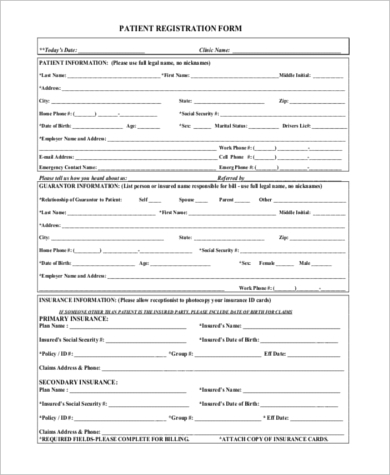 This form grants the clinic or hospital to register you as a new patient. 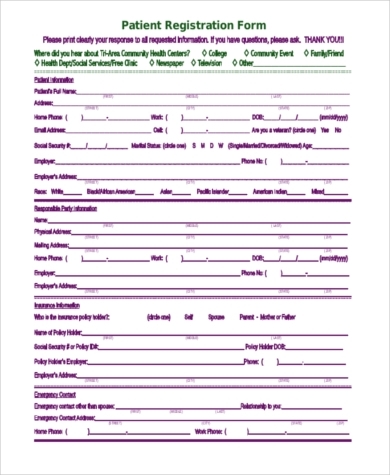 Another important document for any health care provider to have is the medical consent form. 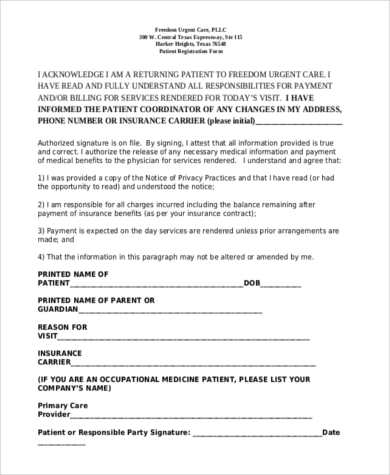 This document states the patient’s informed consent to allow the medical practitioners to administer the necessary medical treatment during an emergency when the patient is unconscious. For examples, refer to our Sample Medical Consent Forms. Medical claims are the invoices you send to the health insurance company detailing what services you’ve provided the patient. 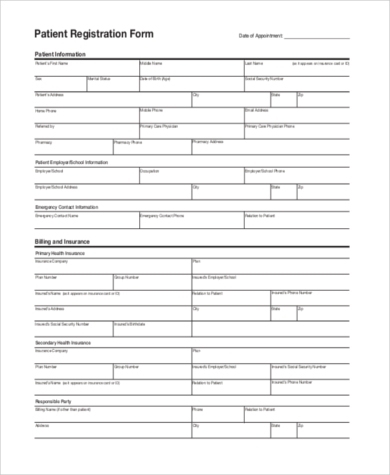 If you are drafting for a health care provider (a clinic or hospital), you might also be interested in these Sample Medical Claim Forms.